Thread Check, Inc. offers American Petroleum Institute ‐ API thread gages to Spec. Q1, Spec. 5B, Spec. 7, Spec. 11B as well as many special API gages. Our engineers have served on various API gage subcommittees. API gages come in all types include casing‐round, line pipe, tubing‐non upset, tubing‐external upset, tubing‐integral joint, extreme line casing, NC connections, regular, full hole, internal flush, H‐90, slim hole, extra hole, wide open, AOH, PAC, XHole, Sucker rods B1 to B6, Sucker rods P1 to P6, Mining, BECO, D1‐22, D1‐42, American National special threads, tapered thread gages‐AWWA, and many special custom gages. Thread Check stocks many popular api gages sizes for immediate delivery. For further assistance with our API gagescontact our knowledgeable staff. Thread gauging practice and thread inspection should conform to the requirements of API Spec 11B. 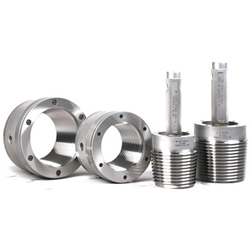 Thread Check, Inc. offers the complete range of API sucker rod and polished rod thread plug and ring gages to API Spec 11B. Thread gages are available to inspect all sucker rod pin connections, box connections, and polished rod pin connections. Our engineering staff have served on various API gaging subcommittees and have worked in the energy industry for many decades. Thread Check's expert engineers can assist you with engineering and building custom gages. Thread Check is a proud member of the American Petroleum Institute.